Joey Smallwood was born on Christmas Eve in 1900 in Bonavista Bay, Newfoundland. He dropped out of school and apprenticed as a printer, but soon moved to the editorial side of newspapers to work as a reporter. He furthered his education by self-study, especially in the areas of social reform and the labour movement, eventually becoming a newspaper editor, union organizer and campaign organizer in the political arena. 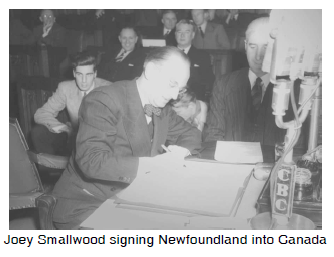 When the depression hit hard in Newfoundland, forcing it to give up its democratic government and make itself a protectorate: a weak country under the protection and partial control of a strong country.protectorate of Great Britain, this had a strong effect on Smallwood and after the Second World War he led the drive to join Canada. By the time he became seriously involved in politics he was a well-known voice in Newfoundland, having worked on radio, broadcasting to all the isolated outposts of the region. Legislature: the branch of government responsible for making laws.Legislature at the age of 75.